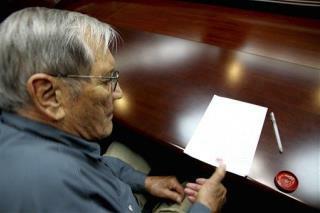 (Newser) – The detention of an 85-year-old American in North Korea appears to be revenge for his actions with a group of guerrilla fighters that did immense damage to the North during the Korean War, the AP finds in interviews with former members. Surviving fighters from the Kuwol partisan unit—glorified in the South but considered the most hated and feared fighters in the North—say Merrill Newman oversaw guerrilla actions and obtained rice, clothes, and weapons for the partisans, but wasn't involved in day-to-day fighting. mr newman is an AMERICAN HERO! every effort should be made to free him! POTUS DOES NOT CARE FOR THE AMERICAN PEOPLE! FUBO! Awww, maaaannn ... why would you go BACK to a country we are STILL AT WAR WITH, when you had led people THEY consider TERRORISTS??? Americans should NOT travel to the DRPK. They are still technically at war with South Korea AND the US. There is a truce in effect that is a "cease fire" NOT a cease hostilities. Any American is subject to capture and long imprisonment in North Korea. North Korean prison camps are death sentences for anyone sent there. People rarely make it out alive, and those that do, usually will die a short time afterwards (some fortunate ones have escaped to the West and were able to get medical treatment for long term illness brought on by years of abuse and conditions in the camps. Most prisoners die of starvation and cold.